In the first grade I was already an advanced reader. I had the natural ability to read 3-4 grade levels above me. By second grade, I could read 7-8 levels above me. Perhaps it was because my mother worked as a page at a local library, perhaps I’m just a genius. Nevertheless, the day my mom brought home Harry Potter and the Sorcerer’s Stone (Philosopher’s Stone to the Brits) I was fully eager to delve into such a meaty book. At first, I was just thinking how impressed my teacher would be and how many AR (Accelerated Reader) points I would receive for tackling such a novel. After several chapters, however, it wasn’t about reading a book anymore.I was fully enveloped in the storyline, the characters, and everything contained in the magical world that J.K. Rowling was spinning around me. I eagerly awaited between books, filling that time with re-reading the books, listening to the books on tape, and forming pictures in my head of each character, creature, and corridor. As each book was released, I was sure to be first to either buy or pre-rent from the library. I was spellbound, and Potter Fever was spreading like an epidemic. In spite of that, even at such a young age I was aware that this wasn’t a book series created to produce revenue. It was a story the author knew would change the world. Mrs. Rowling was right about that. As was expected, Hollywood called. As a kid I wasn’t worried about a terrible page-to-screen adaptation. I was just excited to see The Sorcerer’s Stone with my family and best friend (who I have seen every movie with since). I recall sitting in my room that night, writing in my Harry Potter themed journal about the experience. “I liked the part where Ron said ‘ewww troll bogeys! '”, I wrote. How prolific. In the following years came more books, more movies, and more knowledge on my part. Through my teen years, my inner critic began to grow and instead of laughing at Shamus’ repeated spell malfunctions; I was picking out book-to-film differences to complain about in the car on the way home. Having watched the final installment this evening, I had no complaints. Instead, I felt the same feeling I had when I closed the back cover of the 7th book. Loss. Although Harry lived on paper, he died in my heart. After reading The Deathly Hallows, all I could think was, “what now?” Honestly, what was I supposed to do? The lives I had been following for 11 years had no more story to tell. I fell asleep a little empty that night. Still, I had the film adaptations to look forward to. The final 3 movies kept me excited but a little anxious, I knew what loomed ahead. At least Warner Brothers had the decency to delay my anguish by breaking the final chapter in two. Despite that gratuity, entering the theatre tonight was interesting. I wasn’t excited. I wasn’t sad or frightened. I was strangely at peace with what was to come. More or less like Harry would be when facing Voldemort in the Forbidden Forest. I entered the cinema and took my seat. Starting with flashes of the previous film, the movie moved into an immediately somber scene. Harry sat at Dobby’s grave. Tearing up at the beginning of the film wasn’t exactly what I had planned, so I sipped my soda and watched on. The movie really began without the usual cinematic elements. It felt like the second movie never ended, there was just a year-long intermission. The film followed to story through Gringott’s Bank, Hogsmead, secret tunnels, the room of requirement, and the chamber of secrets. Plenty of realistic special effects filled scene after scene. Movie magic, meeting Wizard’s magic on the silver screen. The filmmakers did an excellent job of giving each important character from the film series adequate screen time. In a way it was much like the final episode of Scrubs (as the true fans of the series see it anyway). Each shot was a final goodbye to a friend or a teacher. It felt like the series was slowly winding down. Like the book, the movie had its moments of complete despair. The sudden deaths of some of my favorite childhood heroes hit me like a wave. The story of Snape was short, but was ultimately captured fittingly. The romance of Ron and Hermione was played off honestly (with a twinge of jealousy on my part). Most importantly, Harry’s acceptance of death was executed with the utmost honor. 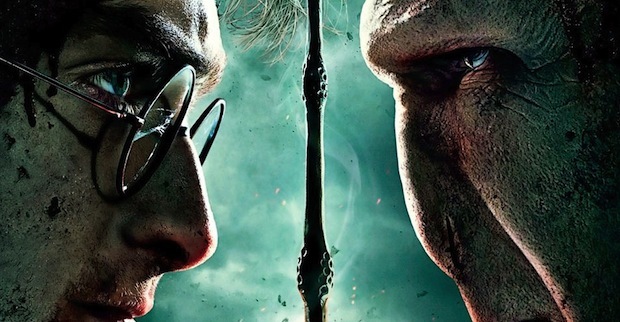 Steven King said of the series, “Harry Potter is about doing what is right in the face of adversity. Twilight is about how important it is to have a boyfriend.” Truer words were never spoken. This puts it into a great perspective; Harry Potter was an honest series that taught honest lessons. This whole review may sound nostalgic and childish, but that is what Harry Potter did for me. I grew up with The Boy Who Lived. I followed him from the cupboard under the stairs to the birth of his two children. I knew that when I struggles, I could come home and read about his and how he conquered them. When life got too real, I dove into the Black Lake to swim with the Grindlows and the Giant Squid. Hogwarts was a second home. I know I’m not the only one who feels this way, I may not have been the fan waiting for the midnight showings in robes and thick rimmed glasses, but I am 1 of millions of people that have experienced Harry Potter together for 14 years. Harry Potter and the Deathly Hollows Pt. 2 brought an end to the World of Wizardy as we will see it, but the spell J.K. Rowling cast on the fans of the series will pass down the dragons, the mermaids, the quiditch matches, the castle, and the magic for years and years to come.